We had a quiet but productive week in our little East Coast castle. We’ve got several perk updates for you, a couple community highlights, and some great news. 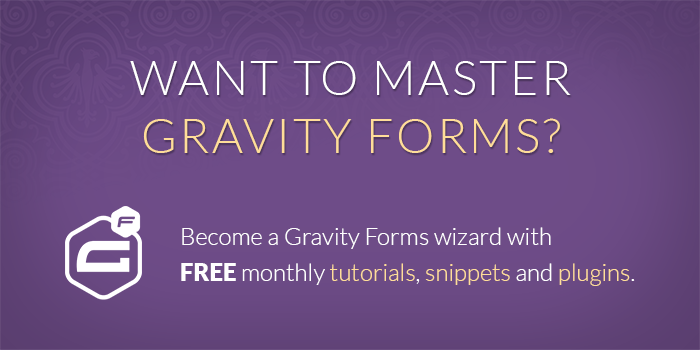 The GF Nested Forms beta will be available to all Gravity Perks license holders by next week! If you’re enjoying these weekly updates and want to make sure you don’t miss one, sign up for our weekly newsletter. You’ll get this same, awesome weekly content delivered to your inbox. Gravity PDF 4.3 Launched; includes support for GF eCommerce Fields. Gravity PDF is the go-to plugin for Gravity Forms PDF generation. We’re particularly excited about their most recent release which includes support for our GF eCommerce Fields plugin. Preview PDFs live with Gravity PDF Previewer Another awesome release from the Gravity PDF team. This add-on gives you the ability to preview the PDF that will be generated as you make changes on the form. This is a really exciting feature! Reminder: If you have something to share with the Gravity Forms community, we’d love to feature it here. Drop me a line at david at gravitywiz dot com. Added support for processing pre-population merge tags in the [noeid] shortcode. Added support for Gravity Flow’s Assignee, Discussion, Role and User fields. Updated unique ID generation to respect the filtered length even if it is below our recommended minimum length. For anyone who did not try this perks yet, I would recommend it highly for you. Also, customer support is awesome. I had a problem with gravity flow user field as read only. I contact support and Jorand and David solve it 2nd day. now it’s working like a magic. Thanks David and jordan for all the work.